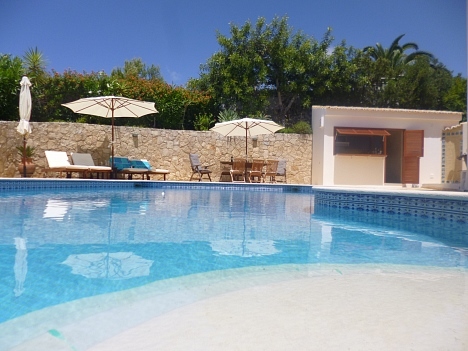 60 Quinta do Paraiso is a stunning luxury, well equipped, air conditioned, 4 bedroom, 5 bathroom villa with a large 12m by 6m kidney swimming pool surround by large terrace and outside pool bar and kitchen. 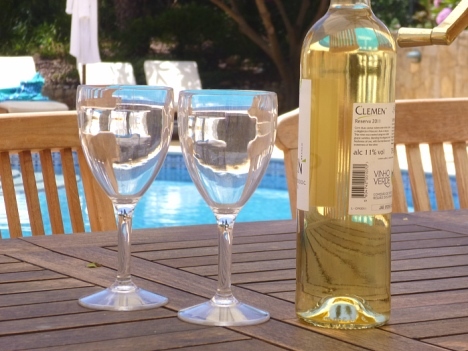 Located on Quinta do Paraiso, it is 10 minutes walk from Carvoeiro town and clients can use Quinta do Paraiso facilities (subject to fee) with 3 communal swimming pools just a 5 minute walk away. On entering the property there is a 'home from home' fully equipped kitchen, with washing machine, dishwasher, microwave, coffee machine, oven, gas hob etc. The kitchen opens up onto an extremely spacious living area, with dining table for 8, sofa and chairs, log fire (perfect for the winter), TV with FTA English. In addition there is WiFi, DVD player, ipod docking station and a selection of games for all ages. Patio doors opens up onto the very spacious terrace area, this hosts teak table and chairs and a lounging area. Sitting here you can chill out and watch the sailing boats past on the partial seaviews (access to the roof is strictly for owners use only). Furthermore on the first floor is a shower room with toilet, basin and bidet. The ground floor has 4 bedrooms, all with twin zip and link beds, allowing the option of twin beds or a superking bed in each room, all the rooms have large wardrobe spaces. The master bedroom has an en suite bathroom room with bath and separate shower and patio doors leading to the pool terrace. Bedroom 2 has patio doors leading to back terrace and an en suite shower room. Bedroom 3 has a patio door with access to the front terrace and opposite its own shower room. Bedroom 4 has only has a window onto the terrace, access to the outside from this one is either via another bedroom or upstairs and out the front door. Next to Bedroom 4 is a shower room with basin, shower, toilet and bidet. Outside the property is set in a good sized plot, fully fenced, mature gardens, electric gates and parking for 3 cars. There is a large 12m by 6m swimming surrounded by a large terrace area with a shaded area. The pool has roman steps with a shallow end of 1m sloping to a deep end of 2m. There are sunbeds for 8 and further tables and chairs. There is a BBQ area, a pool bar with fully equipped kitchen including fridge-freezer, sink, and oven, which is great for preparing and storing the food for your family BBQ. Attached to the pool bar is a pool shower and a separate toilet with basin. The property has beach towels available and a dressing gowns for clients to use.